Your little pup will love to train on bring you your slippers with the Slipper Dog Toy in Orange! 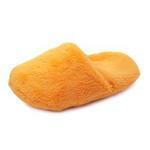 This Little Slipper Was A BIG hit with our Puppy JoJo ! ?? Posted On 12/24/16 by Jackie from , NJ Yes, Jackie recommends this product! I should've checked the size more carefully because it's definitely a bit small for my labs, but for smaller dogs it would've been a cute toy. ORDERED SOME TOYS THAT I HAVEN'T SEEN BEFORE FOR MY DOG AND CAN'T WAIT TO GET THEM. HE'S UP IN YEARS AND LIKES THE SOFT PLUSH TOYS BAXTERBOO ALWAYS, SELLS THE HIGHEST QUALITY ITEMS AND THE QUICKEST SHIPPING I'VE EVER COME ACROSS.